The wait is over! New A’ali’i condos for sale at Ward Village in Kakaako are now offered to the public. A’ali’i at is a new condo buildings in the Ward Village 60 acre master plan in Honolulu. 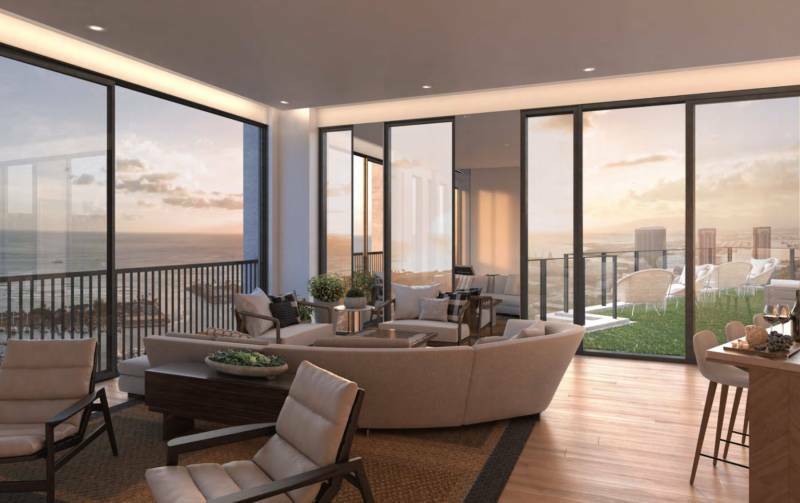 With spectacular amenities, favorable pricing, and optional professionally designed furnishings, A’ali’i condos are on the way to becoming one of Honolulu’s favorites. Location definitely has a lot to do with it. Recognized as “The Best Planned Community in the US” by the Architectural Digest, Ward Village in Kakaako has so much to offer. The developer, Howard Hughes Corporation, has thought of all aspects of the community. In between all the condos buildings, there will be parks, sidewalks, stores, restaurants, a movie theater, security patrols, and community spaces for all to enjoy. The position of the buildings is also pre-planned so any available views, ocean or mountain, will be exposed to the residents from the majority of the buildings. 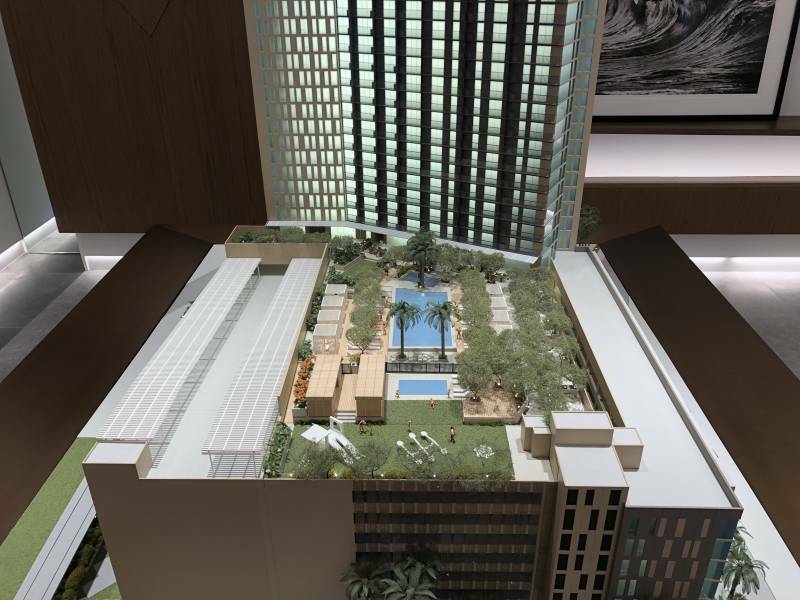 The main tower will have most of the A’ali’i condos, with a portion of the smaller units to be located in the podium below the amenities deck. Each of the A’ali’i condos will have its own lanai, a favorite with many people in Hawaii. Opening the condo unit to the outdoors allows natural light to come in and the outdoors to merge with the living space, creating the illusion of a bigger condo. Of the 751 total units at the Aalii, 150 of the condos will be reserved housing units, to be sold towards the end of the sales phase. These will be available to Hawaii residents who meet income and other requirements of the program. Custom designer furniture for the studio units at the A’ali’i. There are many different smart studio floor plan options at A’ali’i to choose from. 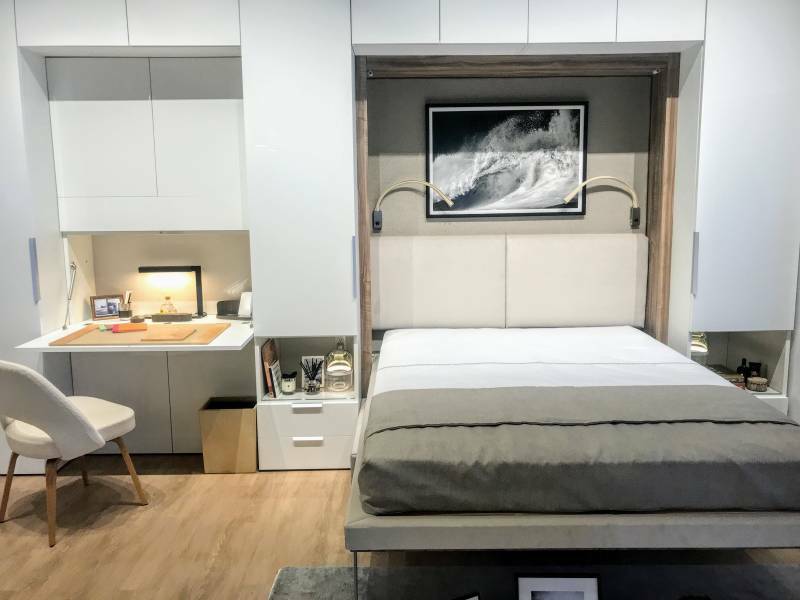 The design of all the offerings maximizes living space by utilizing features like Murphy beds and other multi-functional furnishings. Studio sizes range from 276-373 sq ft. The built-in furniture effortlessly transforms the studio from a cozy bedroom to a roomy space for entertaining guests. 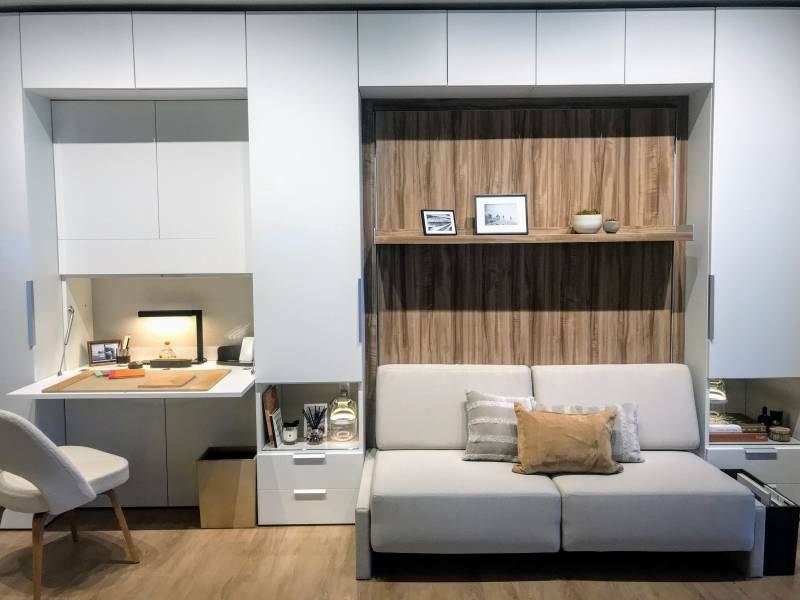 Like the studio units, the 1-bedrooms have also been designed for smarter living. 1-bedroom condos at A’ali’i range from 430-624 sq ft. The large windows highlight the stunning views and convenient location. Great appliances and creative furnishings throughout create a sense of openness throughout the space and make entertaining at this A’ali’i condo a dream. The A’ali’i 2-bedroom units range from 696-837 sq ft and provide comfortable living space. The spacious 2-bedroom condos has a relaxed yet luxurious feel, perfect for hosting guests. The large floor-to-ceiling windows bring in tons of natural light and make the space feel much larger than it is. You’ll enjoy staying in and cooking a meal with the top-of-the-line appliances, or going out and experiencing what the neighborhood has to offer. The studio and 1-bedroom condo units will have optional smarter living designed furnishings. The daytime couch converts into a bed. The 42nd floor will be unlike any other buildings in the Ward Village collection to date. The fitness facility, which includes a yoga room, will have spectacular city, mountain, and ocean views. The 42nd floor will also be a space for residents to enjoy the view and entertain friends and family from an indoor/outdoor sky deck. 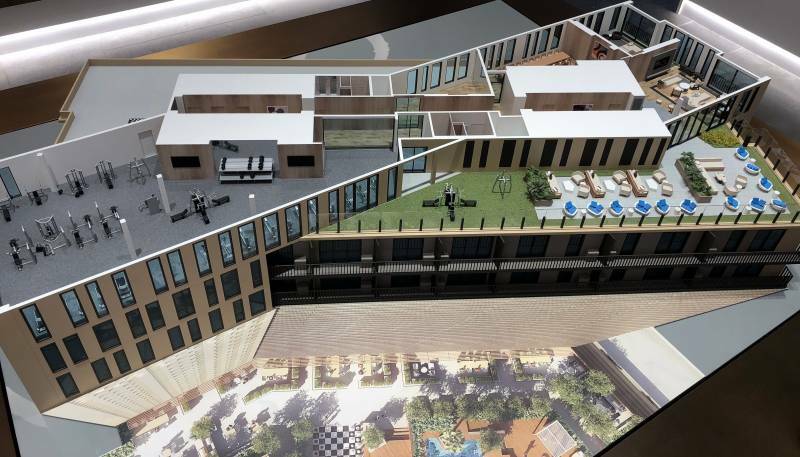 Model showing the A’ali’i fitness facility and social spaces, including the sky deck on the 42nd floor. Pool deck, BBQ areas, cabanas, entertainment areas, and children’s play area. Ward Village area security, community parks, shopping, restaurants, proposed rail, and community events. Pool deck along with tower and podium A’ali’i condo units. 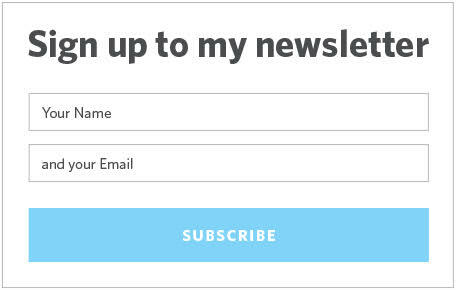 For more information on Oahu real estate or to book an A’ali’i condo suite tour, please don’t hesitate to contact us.